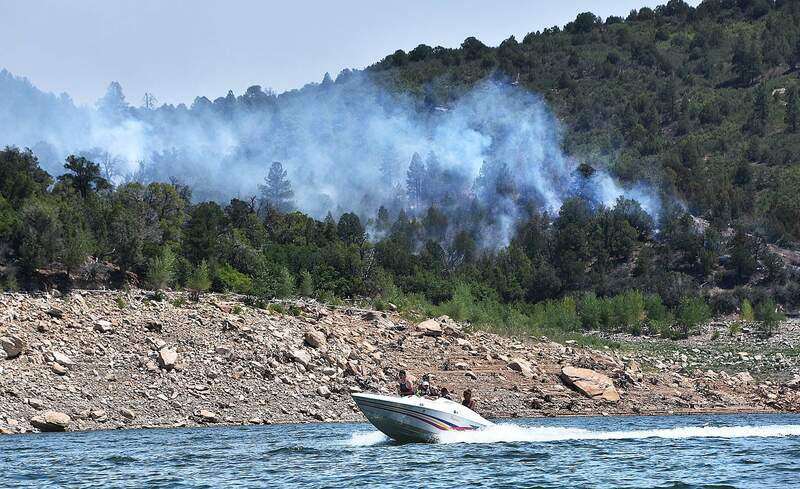 Boaters enjoy Saturday on McPhee Reservoir as the Plateau Fire burns along the shoreline. 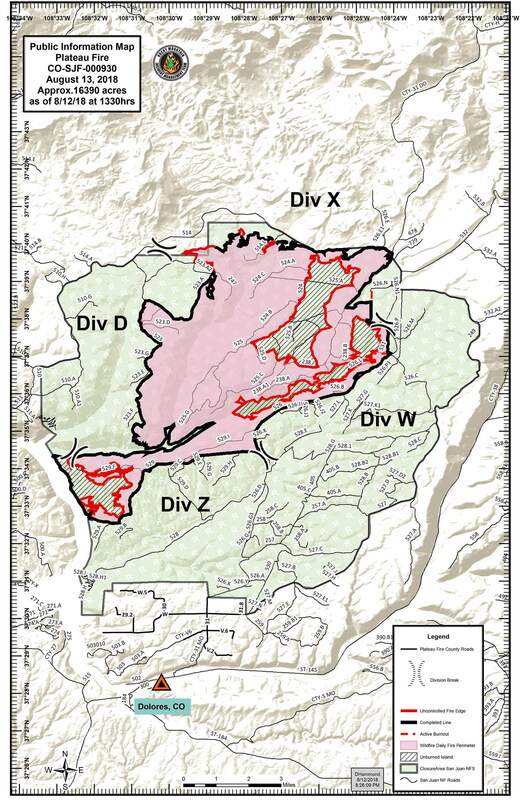 Secure Plateau Fire containment lines are indicated in black. A meeting about the Plateau Fire Sunday at the Dolores Community Center attracted about 60 local residents. The Plateau Fire burning 6 miles north of Dolores grew to 16,390 acres over the weekend but is now 93 percent contained, fire officials said Sunday during a community meeting. A gap in containment on the fire’s northwest edge was all that remained, they said, and full containment is expected this month. The blaze made a significant run southward toward residences last week, fueled by northerly winds, dry fuels and hot weather. On Friday and Sunday, the Plateau Fire received scattered rain showers. Full containment was expected Aug. 30, and the cost of the fire so far is $3 million. A larger Type 2 firefighting crew arrived Thursday and continued previous efforts to establish containment lines at Forest Road 529 on the south, the Dolores-Norwood Road on the east, and Forest Road 514 on the north. McPhee Reservoir is also part of the containment line. Crews will be downsized significantly this week and assigned to other wildfires in the West. On Sunday, 326 firefighters were working on the fire. 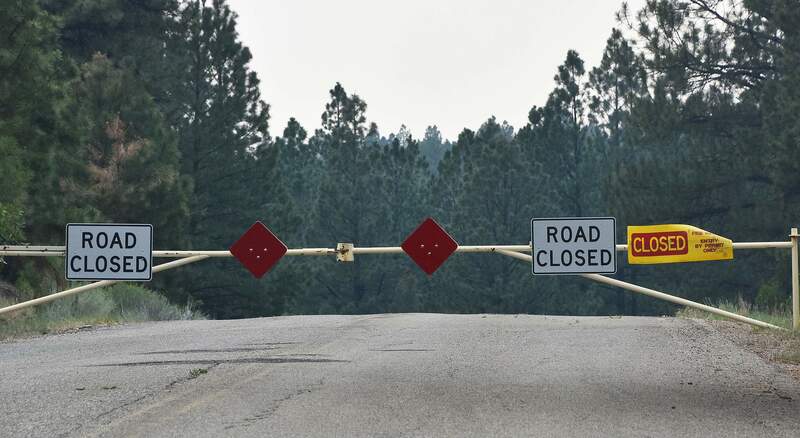 Montezuma County Sheriff Steve Nowlin lifted the pre-evacuation notice for the Granath Mesa area north of Dolores on Sunday, and the San Juan National Forest later announced that the Dolores-Norwood road and House Creek Road and campground have reopened. About 65 pre-evacuation notices were issued door to door Wednesday as the Plateau Fire grew to 9,000 acres and forced road closures that reached from the northern edge of Dolores to the southern tip of Lone Mesa State Park. The Dolores-Norwood Road (Forest Road 526), the Boggy Draw trail system and Overlook Trail also have reopened. Nowlin and Plateau Fire public information officer Pam Wilson encouraged drivers to remain cautious on the Dolores-Norwood Road, which travels north from Dolores through the San Juan National Forest. Firefighters and smoke will still be in the area. Wilson emphasized that the Plateau Fire management team is confident that the fire line along Dolores-Norwood Road has cooled and is secure. Firefighters have walked the lines to check for hot spots about 65 feet into the line, even feeling the ground for heat. Other forest roads and trails in the fire area remain closed. 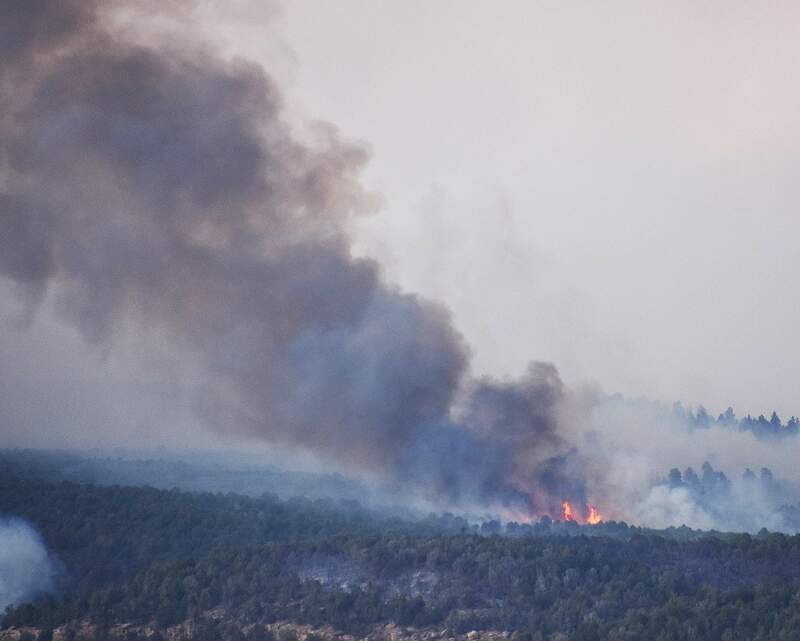 Forest Road 514, on the fire’s northern perimeter is open, as is the Dry Creek Road (FSR 510), which connects to McPhee Reservoir. On Sunday night, about 60 people attended a public meeting at the Dolores Community Center, and many expressed gratitude for the firefighting efforts. The Plateau Fire flares up Sunday afternoon. Some asked whether a heightened effort could have stopped the fire in its early stage. Forest and fire officials emphasized that full suppression was always the strategy for the Plateau Fire and added that the presence of several fires in the area stretched resources. The West Guard Fire in The Glade area started about the same time as the Plateau Fire. The steep terrain of Plateau Canyon made it too dangerous for firefighters to engage the fire directly, said Dolores District Ranger Derek Padilla, so the strategy was to create cleared control lines farther away to encircle the fire withing the canyon. As fire conditions worsened, additional firefighters and air support were ordered. One resident asked why local equipment and staff were not utilized to fight the Plateau Fire. Mike Zion, chief of the Dolores Fire Protection District, responded that because the fire might threaten property in the district’s jurisdiction, the district is required to keep its resources available to protect those properties, such as the 65 homes under the pre-evacuation order. 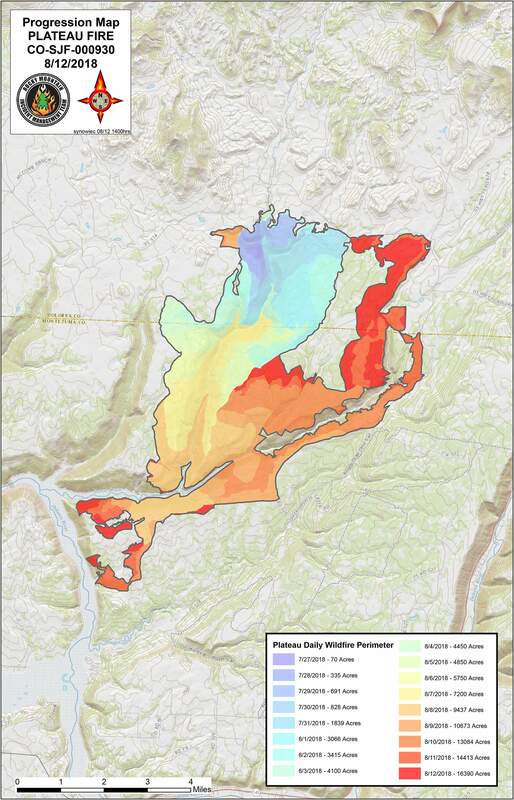 Post-fire risk: ErosionThe risk of erosion from the Plateau fire’s burn scar into McPhee Reservoir is considered low, in part because Plateau Creek and Beaver Creek drainages are not prone to debris flows. If monsoonal rains arrive, some sediment could flow within drainages that feed McPhee, but it will not be a significant amount, said San Juan National Forest hydrologist Shauna Jensen. Low-intensity fires and unburned areas in Plateau and Beaver Creek drainages might help shield McPhee. “This is significant, as it will buffer any sediment that comes from the hillslopes,” Jensen said. Saturday: Gains in containmentFirefighters began to make significant gains on Saturday, after a rain shower the day before. Air temperature dropped, and relative humidity rose about 60 percent. By Saturday afternoon, the fire’s growth had slowed, reaching 14,403 acres, up from 13,084 acres Friday. Containment was raised to 45 percent, up from 30 percent. Crews strengthened defense lines, continuing its indirectly suppressing the fire by igniting planned burns on the eastern and western sides of Plateau Creek and the southern side of Beaver Creek Canyon. In a briefing Saturday morning, Rocky Mountain Team Black announced that fire crews made progress on burning a fire line on the southwestern division that extended from Forest Service Road 529 toward McPhee Reservoir. The fire burned past Beaver Canyon, but did not reach the House Creek area or road. A Sheriff’s Office message on the Nixle alert system incorrectly stated the fire had crossed House Creek. Crews also made progress on securing the western side of the fire and inserted a Hotshot crew to build a line at McPhee Reservoir and connect it to a secure line north on FSR 523. On the fire’s east side, crews built a line from the fire’s northernmost edge on The Glade Road eastward to connect with a line near Dolores-Norwood Road (FSR 526), thereby containing the fire in the northeast corner. As a result, public information officer Wilson said Saturday, fire officials expected more interior burning in coming days, but without outward expansion. Firefighters also worked to connect a fire line along the Dolores-Norwood Road southward to the secure line on House Creek Road (FSR 528), which would complete the circle, resulting in 100 percent containment. Three structure protection teams from the Front Range patrolled structures in the pre-evacuation area. 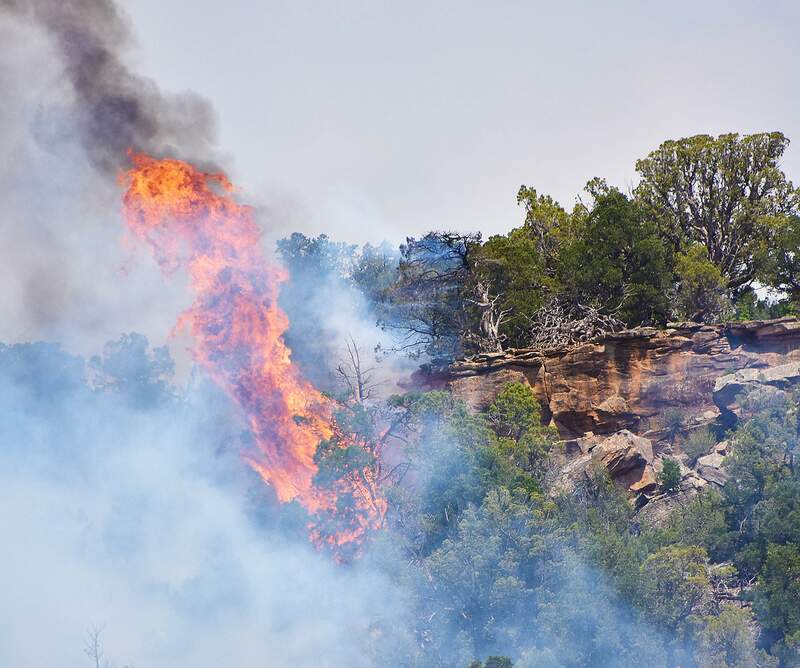 On Tuesday, the fire made a significant run south down Plateau Creek Canyon past Beaver Creek and the northeastern tip of McPhee Reservoir. Overnight, strong winds pushed the fire farther south and east past Forest Service Road 529 but still north of House Creek Road (FSR 528). Montezuma County set up an Emergency Operations Center and a hotline at 970-564-4998 or 970-564-4999 and reminded residents to call 911 if they had an emergency.